I’ve been revisiting an incident that happened last week that gave me such joy and I’m trying with all my might to hold onto it, to make it the broom that sweeps away some of the sorrow that has taken hold of my heart and mind. Mark and I were driving back from a night out at dinner, listening to my IPod, which was on shuffle. We talked with the music in the background when suddenly one of Jordan’s favorite songs, “My Favorite Things,” by John Coltrane came on. Mark glanced at me, “Do you want to hear this right now?” I shook my head no and he advanced to the next song. Suddenly we were listening to, “My Favorite Things,” by Luther VanDross, once again Mark hit forward pushing us to the next song. Well, there was Julie Andrews brightly singing, “Rain drops on roses…” Mark and I looked at each other in disbelief and he once again advanced to the next song. Then, there he was filling the car with his voice. Jordan’s Rap filled the car. 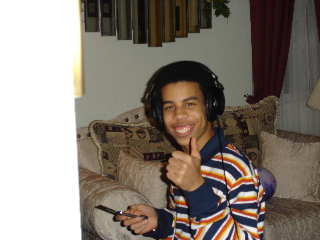 Jordan loved making beats and rapping over them, and this particular song, which is my favorite of his, he made his senior year in high school. Mark motioned to change the song and I grabbed his hand. And we sat in the garage hearing the booming voice of my gone too soon son loving his lyricism, wit and talent. What would he have become? He had so many gifts. When the song ended we left the car, walking towards the house hand in hand. I smiled thinking of how strongly I felt Jordan’s presence and thanking him for another visit. Every time since listening to his song in the car, on the “random” play of songs, I smile and think of how happy my boy made me. I don’t want to lose that feeling. I’m keeping it in a corner of my heart, making a big space for it so that some of the gloom and darkness that has kept me from smiling can be overtaken by the joy, pure joy that I felt that night when Jordan so clearly let us know, I am here. Look for me, listen for me, I’m still here.